Unfolding in the majestic waters of the Caribbean, this new eco friendly resort is located on white sand beaches in the provence of Bocas del Toro. Tucked away on a secluded part of the island is an experience you will never forget. Unlike other tourist destinations. Relax and enjoy nature as you spend your days lounging on the beautifulRed Frog Beach and your nights falling asleep to the peaceful sounds of the jungle and the rhythm of breaking waves. 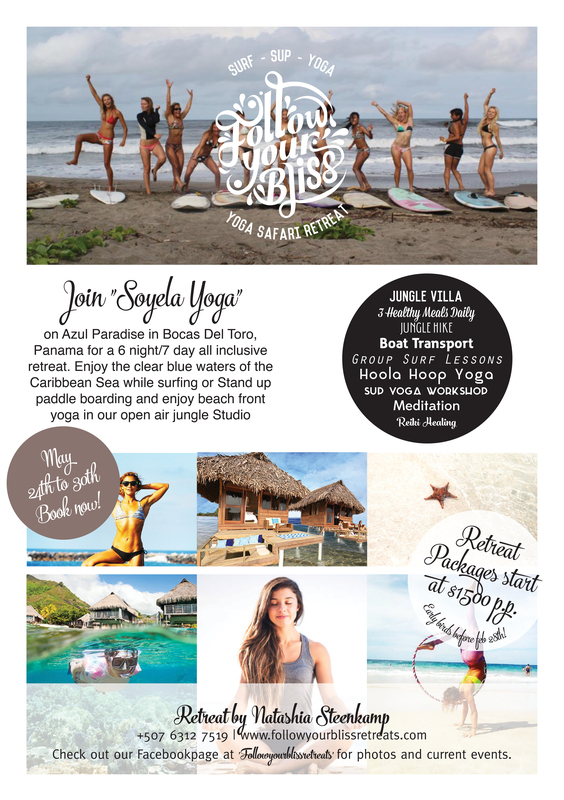 Your retreat includes a week of yoga, surfing, stand up paddle yoga, relaxation, and adventure. Round Daily yoga classes with Soyela Shafer. Meditation, Chakra healing & balancing, Crystal workshop. 6 nights/7 days accommodation in a Jungle Villa. 3 fresh and healthy daily meals (vegetarian or non-vegetarian options available) with fresh juices and coconut water. Use of stand up paddleboards, surf boards, kayaks and beach chairs. “Bliss is that deep, fulfilling, sustainable, driving need you have. That thing that is the true ‘you’. Your bliss is your life’s purpose.